A geometrically perfect water with the "Message" your body is waiting to receive. 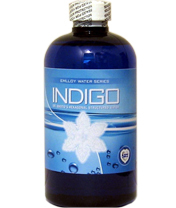 Dr. Emoto's Indigo Water contains eight ounces of highly charged hexagonally structured concentrate. By mixing one ounce of concentrate with one gallon of distilled water, you are creating eight gallons of structured water from this 8 ounce Indigo water. This is about a one month supply of structured water. Dr. Emoto’s “Message from Water” books and his recent exposure in the movie, “What the Bleep Do We Know,” have changed our understanding of consciousness and our connection with water. As a long-time advocate for peace in relation to water, Dr. Emoto acknowledges his role as a “messenger,” teaching and conducting seminars throughout the world. His mission - to raise the level of awareness concerning water, and to heal the earth’s water includes a recognition of the fact that we are mostly water. Re-establishing the perfect geometry in our “water bodies” is one step towards that goal. After many years of research and conscious deliberation, Dr. Emoto is able to provide the world with a stable, consumable hexagonal water, imprinted with frequencies to support creativity, balance and conscious awareness. In conjunction with the recent United Nations declaration of an “International Decade for Action - Water for Life,” Dr. Emoto has formed a non-profit organization. The International Water for Life Foundation is dedicated to education, research and the establishment of a system for distributing the “water of life” throughout the world. Ten percent of profits from the sale of Dr. Emoto’s Hexagonal Water are donated to this organization. Dr. Emoto and others have theorized that water has the ability to receive and transfer what the Japanese call “hado” (vital energy). The perfect hexagonal geometry appears to have a greater capacity to transfer this vital energy. A number of methods exist for photographing energy fields. Among them is Kirlian photography. This method uses high frequency electron streams to photograph the invisible energy fields radiating from all living/organic things. Through a Kirlian camera, the energy emanating from the fingertip shows the difference before and minutes after drinking Dr. Emoto’s Hexagonal water. Most diseases can be traced to dehydration. It is the number one cause of stress in the human body. When there is insufficient water, every biological function suffers. Chronic dehydration has been linked with headaches, asthma, colitis, diabetes, heartburn, peptic ulcer pain, high blood pressure, blood cholesterol and many other symptoms. However, our most recent research is revealing that it is not just the lack of water, but the lack of hexagonally-structured water that is of greatest importance. Dr. Emoto’s Hexagonal Water is more easily assimilated at the cellular level. It may be one of the best ways to overcome dehydration and protect your body from the symptoms of disease and premature aging. Within minutes, Dr. Emoto’s water moves into the cells, taking nutrients and expelling metabolic wastes more efficiently than bottled water. Dr. Masaru Emoto was the first water researcher to discover a method for visually revealing the structure of water. Through high-speed photography, he has been able to capture the structure of water at the moment of freezing. His work has demonstrated that a majority of the water we drink is lacking in organization and hexagonal structure. His work has also been important in determining that certain energetic influences can restore the biologically- preferred hexagonal matrix of our water. Dr. Emoto and others have studied the effects of different energy fields on water’s ability to organize and “hold” the perfect hexagonal structure. Using a combination of scalarwave energy, laser light, inert noble gases and frequency-emitting crystalline ceramic oscillators, Dr. Emoto’s Water is hexagonally structured and imprinted with specific frequencies which are designed to stimulate and encourage mental coherence, symmetry and balance the qualities necessary for optimal functioning in a complex world. Dr. Emoto formed a partnership with Robert Lloy in 2003.”EmLloy” Mr. Lloy is the inventor of the Voice Spectral Analysis program and the miracoilTM and has synergistically combined formulas of proprietary frequencies with scalarwave energy to the above mentioned technologies to create hexagonal structured water. The mission and intent of the EmLloy partnership is to provide humanity with structured water to uplift and raise consciousness.